The weather is just starting to turn here, and with it, my longing for soup and stew. Chowder is the perfect middle ground between soup and stew - hearty, hot and full of delicious ingredients and enough to fill you up as you contemplate hibernation. 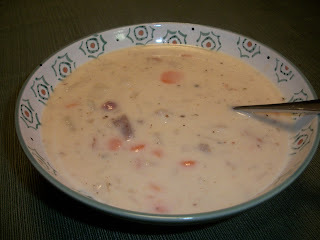 I've made this chowder now twice in the last two weeks - it is just THAT good. And here's a little secret: once it's cooked, it's difficult to detect the fish - SO, if you have people who "claim" to not like fish, but you want them to eat it anyway (ahem), this is the perfect recipe. They will be distracted by the bacon, potatoes, carrots and corn and not even realize the other goodness that is in their bowls. And for those of us who love fish, we can just happily eat it without saying a word. This chowder uses an interesting ingredient - oyster crackers. (These are not crackers made of oysters, but rather, the name of those little white hexagon shaped things that come in small cellophane packages at diners and the like.) The crackers help to thicken the soup and also add a dimension of flavor. So if you need to warm up, make this soup! Leftovers are great for lunch the next day, if your crew doesn't "chow (der) it down." Tee hee. Find more great ideas at Hearth and Soul, Clever Chicks, Fabulous, Show and Share, Create, Link, Inspire, Wow Me, Wow Us, What's Cooking, Full Plate, Showcase Your Talent, Favorite Things, Foodie Friday, Friday Frenzy. In Dutch oven, brown bacon over medium-high heat, then remove to a paper towel-lined plate. Drain all but 1 tablespoon bacon grease, then add onions and garlic to the pot and saute until soft. Add celery, carrots and potatoes, and cook and stir for several minutes, being sure to scrape up all the brown bits leftover from the bacon. Add chicken broth, water, cracker crumbs, salt, pepper, and thyme. Stir and bring to a boil. Reduce heat to low and simmer until potatoes are soft (7-10 minutes). Add fish and cook until fish is cooked throughout (5-6 minutes). Add milk, bacon and corn and heat through. Adjust seasonings to taste, and serve! Serves 6. 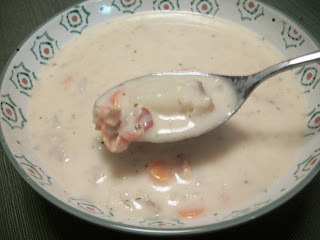 Your New England Fish Chowder looks so delicious and satisfying, Sara! Love the addition of the oyster crackers - I absolutely adore them. Sadly I can't get them here in the UK - but as they need to be crushed for your recipe I can always bring some back from the US in my suitcase next visit :-) Thank you so much for being a part of the Hearth and Soul Hop.